6-CD box (LP-size) with 120-page book, 161 tracks. Playing time approx. 394 mns. Forget all the testosterone swirling around Sun Records. Sure, the label is famous for discovering Elvis, Jerry Lee Lewis, Johnny Cash, Carl Perkins, Charlie Rich and Roy Orbison. But there were also female artists at Sun - a fascinating collection of southern women. Most of them were young. Some were teenagers with powerful, grown-up voices. Who were these aspiring singers and what did their music sound like? 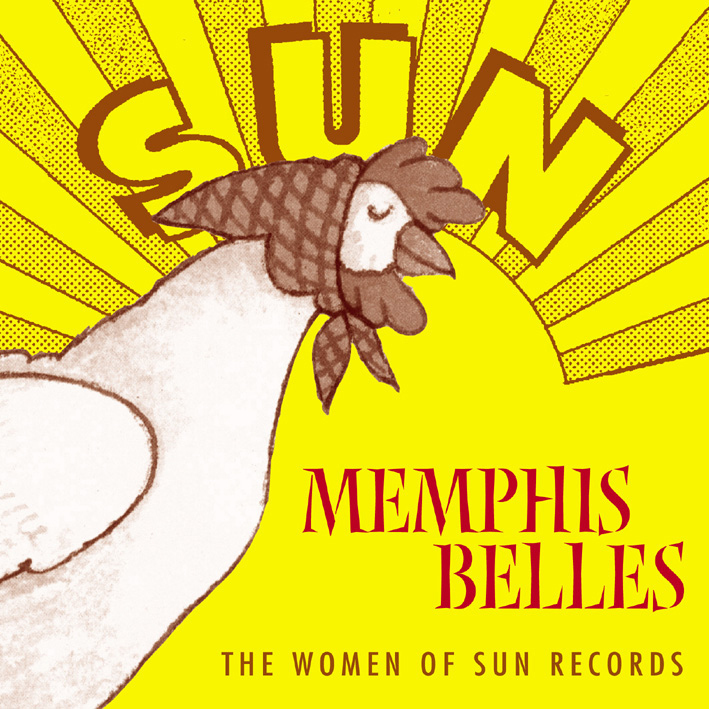 "'Memphis Belles': The Women of Sun Records" offers an unprecedented look at the women who recorded for Sun Records more than half a century ago. The box set presents nearly 40 different singers and over 150 tracks - by far the most detailed look at these forgotten women and their music. Sometimes their lives were as poignant as their songs. Some ended tragically. Others found a degree of fame and fortune, if only fleeting, before retiring into obscurity. Sun historian Hank Davis tells the stories of these largely unknown singers from rock 'n' roll's early days, and accompanies them with a wealth of photographs, many previously unpublished. Until now, the women of Sun Records have remained a largely overlooked part of the Sun saga. This collection of their music and life stories offers the first real glimpse at an unappreciated side of the legacy of Sun Records. Sun Records - In the spring of 1952, Sam Phillips risked founding his own record label - Sun Records. He had been an independent producer for several years and recorded the greatest R&B hit of 1951, Jackie Brenston's Rocket 88. So Sam Phillips knew he had chosen the right job. But would it work with Sun Records, when many independent labels had to close down quickly? It didn't look good at first either. After only two releases on Sun Records there was already a one year break. But gradually the hits set in: With recordings by Rufus Thomas, the Prisonaires, Junior Parker and of course Elvis Presley. Then there was no stopping. Carl Perkins, Johnny Cash, Jerry Lee Lewis, Charlie Rich, Roy Orbison, Conway Twitty, Carl Mann, Billy Riley, Warren Smith and many others joined. They have permanently changed the world of pop music. 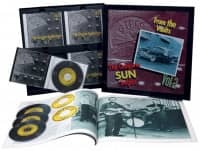 After the sale of the label Sun Records in 1969 there were countless re-releases of the material. But only Bear Family has always moved at a high quality level. Only these new editions of Sun Records are recommended. Because these CDs and CD album box sets deliver the best sound, the best photos, the best accompanying texts and the best presentation! 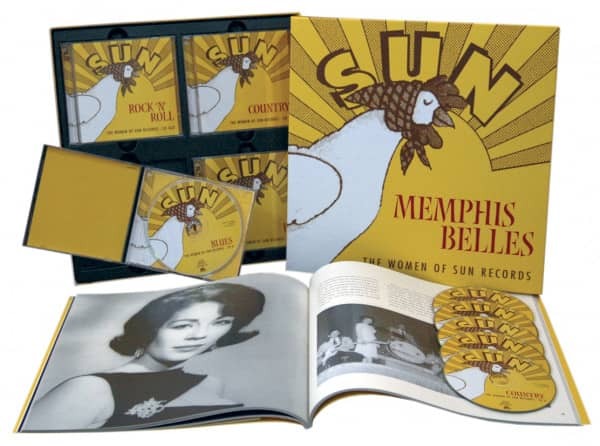 Customer evaluation for "Memphis Belles - The Women Of Sun Records (6-CD)"
Von der Ausstattung, über die Aufnahmequalität bis zum Begleitbuch und die gesamte Aufmachung ist alles "überdurchschnittlich gut" - kann ich nur empfehlen.